Contains premium organic and wild-crafted: Cinnamon Bark, Lemon, Lime, Mandarin Orange, Black Cumin, Clove Bud, Eucalyptus (R), Nutmeg, Thyme, Oregano and Ravensara essential oils. Spice of Life™ blend was inspired by a band of spice traders in the 14th century. Amazingly, none of these traders contracted the black plague rampant at the time. When asked by a king to reveal their secret they revealed that they were using the very spices they traded to prevent illness and protect their immunity. 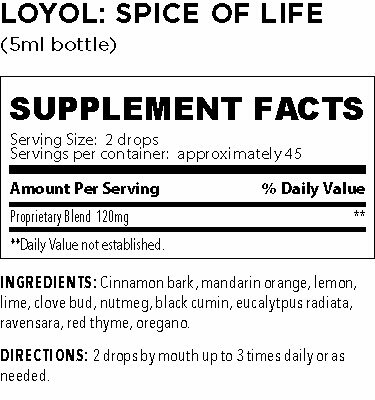 After countless hours of searching ship manifests, these legendary spices have been identified and combined in Spice for Life™ blend. Research within the past two decades is starting to confirm what these spice traders hundreds of years already knew: these spices have powerful antibacterial, antifungal, antiviral, antimicrobial, antineoplastic, and anti-inflammatory properties. Spice for Life™ has rapidly become a favorite with Be Young customers. Add 3 drops to a vegetable capsule and fill the rest up with a carrier oil. Put a drop of Spice of Life™ on the back of your hand and lick it off. Swish it around to gather up some saliva and swallow. 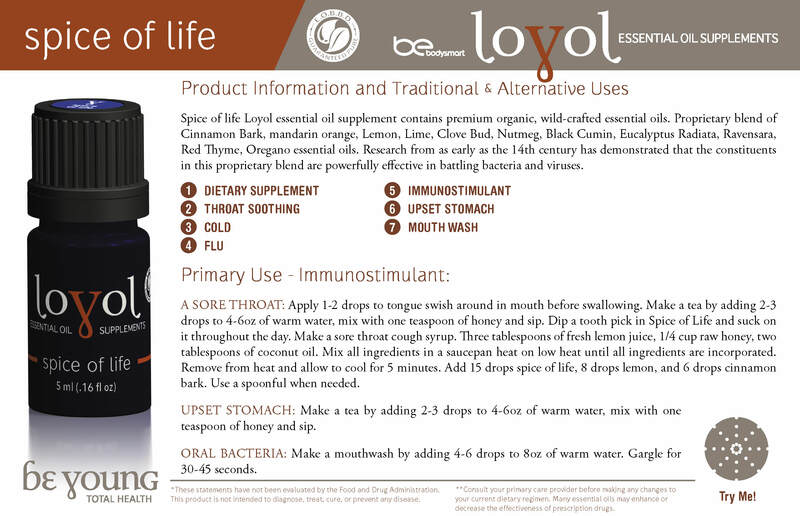 Add 1 drop of Spice for Life™ to a cup of tea to help boost the immune system and help with sore throat. Add 5-8 drops of Spice for Life™ to a small spray bottle fill the rest up with water and use as a sore throat spray. Be sure to shake well before every use. Add 5-8 drops to your cleaning water for a natural disinfectant and sterilizer.